“My PlayHome is a doll house for the iGeneration…where your child can use everything, even the closets, TV and shower…fry an egg and feed the family pizza. Where you can pour drinks, blow bubbles and turn out the lights.” (via the iTunes description). The app design and premise is basic: An interactive doll house where you can touch, move, and manipulate the environment. The lite, free version comes with 2, fully-functioning rooms (living room & kitchen). The full version comes with 6 rooms: Living room, kitchen, backyard (including trampoline, garden, tree house, & tire swing), bathroom, child’s room, parent’s room. Almost everything in the house works or moves: Faucets, doors, books, CDs, T.V., toy blocks, toothpaste, toilet, shower. The list is endless. Every room provides commonly found items which expose users to vocabulary within a specific context. If you are interacting with a character in one room and want to go into a different room, once you toggle away, the characters appear in the drop-down ‘cloud’ on each screen to continue interacting with. There is a “Tidy the House” button which puts all items back in their original position. Great for multiple groups per day, won’t have to remember to clean up each room. It does not allow for inappropriate interactions. For instance, you cannot take the character’s clothes off completely. There is a set of pajamas in the child’s room which can be changed and hung up in the closet. Basic social skills can be demonstrated or discussed in context. If you need to practice using the restroom, go into the bathroom and talk about what to do first/second/last. The backyard has a garden where you can grown carrots. By watering the carrots, you can then pull them up by their stems. Of all the features in this app, this is by far the one all my kiddos want to use. There are multiple races represented in the app. Always a great feature to foster discussion of different cultures and ethnicities. Prepositions – The characters can sit, stand, and lie down. Items and people in the room can be placed on/next to/beside/between/under/on top/over other fixed objects. Application. Opposites. Turn the lights on/off, place objects up high/down low. Swing the tire swing fast/slow. Function of nouns. When learning the function of items, having an app that let’s you demonstrate functionality is invaluable. Articulation. If a client is working at sentence or conversation level, generating topics from cards or thin air is tricky. Interact side-by-side with items that have their target sound. Phonological Processes. Especially final consonant deletion, practicing carry-over to add those final sounds is difficult. But when they think they are playing/describing what they are doing, I prompt to add those sounds and take data. Pragmatics. Practice greetings, appropriate behaviors in the bathroom or outside. Adding more clothes in the closets besides pajamas for just the kids. The addition of baby clothes, adult clothes, an apron for the kitchen, or dress-up clothes for the kids to play with. Additional bathroom items. Adding a brush, hair dryer, shaving cream, perfume, or other bathroom utilities would be nice. A settings page before entering the app. The only way to turn sound on/off is to use the iPad buttons. You can turn the music on/off in the living room by touching the CD player, but that’s the only in-app way. Adding additional food in the kitchen. There are a limited, American-style food options currently, such as pizza, Popsicle cereal, milk, juice, cupcakes, sandwiches, eggs, and cola. Adding diverse foods such as meat options, vegetables, fruits, etc. Hoff, E. (2006). How social contexts support and shape language development. Developmental Review, 26, 55-88. Huff combines two schools of thought on language acquisition: (1) Acquiring language is a product of internal, mental process and (2) the interaction of social contexts shaping language development. Her discussion and summation of evidence regarding “the influence of conversational settings” specifically relates to My PlayHome. A review of the evidence suggests communication interactions during joint-attention book reading is more complex, incorporates larger vocabulary and naming, and is less demanding on the child. 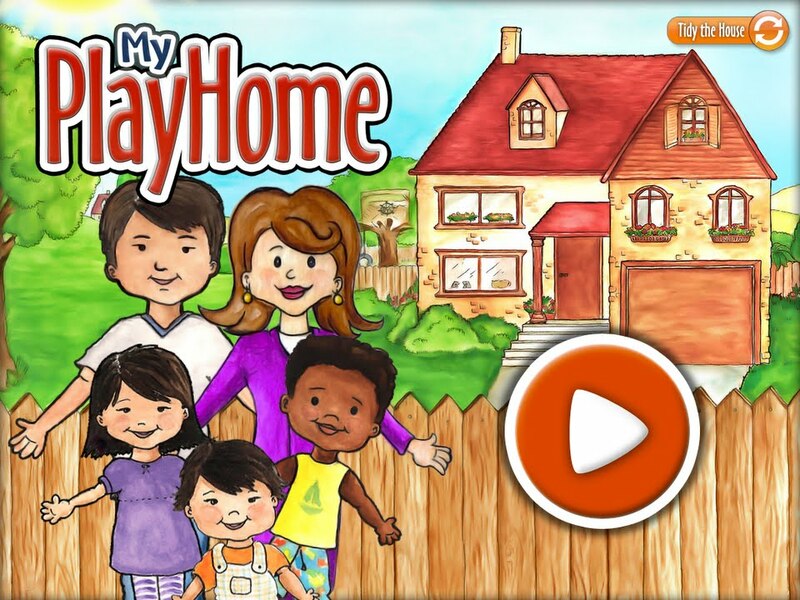 My PlayHome has the potential to create the same join-attention and joint-interaction situations with a variety of ages. Try out the free, lite version and see for yourself if it doesn’t create these meaningful interactions you’ve been looking for lately. Nice review. I always use this app as an exemplar in my presentations. Gold standard. Thanks for the mention of research too-very thoughtful. I found this as well: Fisher (1992)- meta-analysis finds body of evidence that sociodramatic play promotes problem-solving abilities. Alaskan Speech-Language Pathologist (CCC-SLP) who transitioned from schools to specialty private practice. Want to email me? Use the contact form on my “About Me” page. Good student or good SLP? You decide.